To see a detailed breakdown of all features, along with optional add-ons, download the sales sheet here. 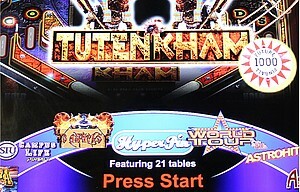 PINFERNO comes with 22 licensed original tables - for personal or commercial use - created by enthusiasts of the pinball community from around the world. Hundreds more are available online for personal use. No detail overlooked: PINFERNO's construction honours every detail of machines from the past: cabinet dimensions, button position, 100% authentic legs & lockdown bar, and tempered glass. You get the look, feel, and strength of a commercial-grade machine, built to last. Gameplay is smooth thanks to competition-grade flipper buttons and a dedicated graphics processor. Sized to scale and measured to fit without any edges, you won't even know it's digital. Premium PINFERNO models include a 40" 4K LED playfield, a 27" 1080p backglass, and a 14" dot matrix display (DMD) monitor. Additionally, a camera tracks your body position to generate a 3-D playfield. An acoustically tuned 50-watt 2.1 sound system paired with force feedback is so strong you can "feel" the flippers. Instructions are included to add 1500+ tables. Even better, the software allows you to build your own tables; be it a re-creation of your favourite (for personal use), or your own original masterpiece. To truly personalize PINFERNO, you an build your own through our kits. You'll only need basic tools, and the experience will last forever. 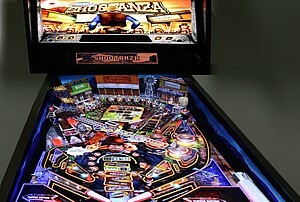 Gone are the days of frequent pinball machine maintenance. 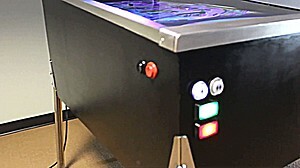 PINFERNO regulates its internal temperature and contains virtually no moving parts, so you can focus on setting the high score. However, if the action gets a little too intense, you're covered with a full warranty for 1 year from date of purchase.